Rev. Ed Haugh was the founding pastor of Grace Baptist Church. The church was launched in a living room meeting on January 20, 1959 in the home of Samuel Menig. A group of Christians in the Hazleton Area wanted to see a conservative Baptist church be launched that confidently believed and courageously taught the Bible and the true gospel of salvation through Jesus Christ alone. Grace Baptist Church held its first services in the former Broad Street YMCA Building. 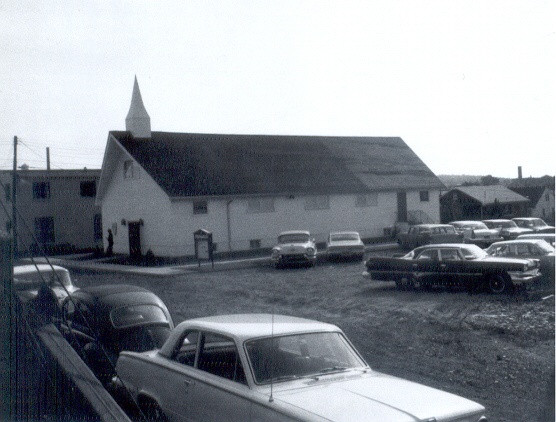 Grace Baptist Church was incorporated on August 18, 1959. At the end of its first year, Grace Baptist Church had 15 official members. The current property on Samuels Avenue (4 lots) was purchased in 1960 for $266.76. The church held services in the basement of its first building until the construction was finally completed. The first building seated approximately 125 people and had a hand-made steeple. Grace Baptist Church began fellow-shipping with the General Association of Regular Baptist Churches www.garbc.org in 1962. Grace Baptist Church once operated a small Christian school called “Grace Baptist Academy” in the late 70’s and early 80’s. Grace Baptist Church ran a bus ministry in the 1970’s during the height of the bus-ministry phenomenon. An expanded sanctuary and fellowship hall was built for $300,000 in 1988 with seating for 275. Grace Baptist Church has had eight pastors and four interim pastors in its history. Pastor Stanley W. McMinn was the church’s longest tenured pastor at 19 years, from 1982-2001. He went home to be with the LORD in January 2001 following a battle with esophageal cancer. From 2008-2013, Grace Baptist Church produced the “Preaching for a Change” television broadcast, a 30-minute broadcast featuring the expository preaching of Pastor Ryan Day. This weekly broadcast was featured on Service Electric Cable and MetroCast Cable in Northeast Pennsylvania. In 2009, Grace Baptist Church celebrated its 50th anniversary, and received a special commendation from the Pennsylvania House of Representatives. In 2015, Grace Baptist Church celebrated its mortgage payoff of the updated/expanded church sanctuary and fellowship hall. To God be the glory, great things He has done! We rejoice in the storied past of Grace Baptist Church, and look forward with great anticipation to what God will do in days ahead, for the advancement of the gospel and the glory of His Name.